The American TFP > Fighting the Culture War > Are Youth Hopelessly Addicted to e-Books? There is a tendency among older people to write off youth as enthusiastic supporters of all that is modern in today’s culture. If something is traditional, it is assumed that young people are against it. This is especially true in the field of the technology. Young people and children are supposedly obsessed with digital media. Are these assumptions correct? Not necessarily. Researchers are finding that children and young people are a lot more traditional than imagined. When asked about their reading preferences, those surveyed overwhelmingly prefer print to e-readers. An example of this was a recent survey conducted by the English association BookTrust that investigated preferences and practices by interviewing 1,511 parents of British children under 8 years old. The study found that 76 percent of the children prefer print books for pleasure reading while 69 percent prefer print books for educational reading. The reasons given for preferring print books are innocent and organic. There is something about a real book that is irreplaceable and comforting. Children say they like to turn the pages. They like the satisfaction of owning a book and the act of choosing it from their family library. These children are not from “technologically challenged” households. In fact, the same print preferences apply to what the researchers described as “highly digitized households” where 92 percent of parents and 73 percent of children are “confident users of technology.” In homes where e-readers were available, only 19 percent of children report using them daily while 57 percent never use them. Parent concerns also entered into the equation. Most parents fear early exposure to e-books will have an effect on their children’s attention spans. Others fear too much advertising or inappropriate content. Still others simply feel that the print medium is a much more personal manner of reading together with their children. And children appear to respond to these concerns by actually preferring to feel the paper. Someone might object that a survey of small children does not prove that youth in general prefer print books. As children grow older, they will inevitably fall for the allure of the digital and abandon print books to be more with the times. Another survey by Naomi S. Baron, a linguistics professor at American University, found the opposite to be true. Actually, compared to the children in the survey above, many more university students preferred print for serious reading. For her book Words Onscreen: The Fate of Reading in a Digital World, Dr. Baron surveyed over 300 university students from Germany, Japan, Slovakia, and the United States. She found that 92 percent of the surveyed students actually preferred to do their “serious reading” in print. Again, the reasons for the preference are fascinating and innocent. The irreplaceable qualities of the book cannot be replicated by e-readers, iPhones, laptops, or tablets. Many students said the smell of the books is what attracted them to read the real thing. Others said the book gave them a sense of where they were within the book and even within a single page—something the e-reader cannot instantly provide. E-books tend to cause distractions, eye strain and headaches. Yet others said the printed book makes it easier to see who the author is since the information is always on the back cover or book jacket. There is a unique sense of accomplishment in reading a print book that is not felt in the digital version. Dr. Baron admits being surprised by the results since everyone seems to assume that by making books more convenient, environmentally-friendly and cheaper, the students would automatically like them. Apparently, no one bothered to ask students what they think. That is the tragedy of the times. Trends and fads seem to dictate how one is to live. No one seems concerned about what people really want. 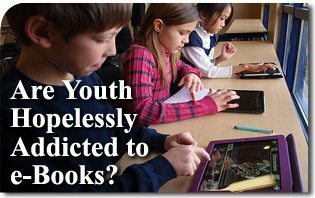 Moreover, pushing things like digital books on youth affects all society. Many older people get caught up in the frenetic intemperance of novelty, and rush out to get all things modern in order not to be left behind. Under the pretext of keeping up with the youth, they adopt habits and gadgets that they normally would not acquire. Next time someone says youth is on board with some radical ideas, products or even social issues, perhaps it is the case to ask the children and get the real answers. The results will probably be surprising. This entry was posted in Fighting the Culture War and tagged addicted, America, answer, Are Youth Hopelessly Addicted to e-Books, book, children, digital, e-book, fad, Media, old, Order, paper, preference, print, read, research, result, social, society, Student, Tradition, trend, university, world, young, youth by John Horvat II. Bookmark the permalink.